Stephen H. Martin’s passion lies in acrylic paintings on canvas. 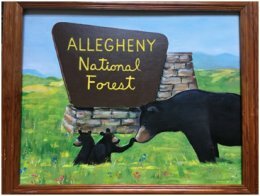 He chose his business name Lost Pines Artistry for his love of the Allegheny National Forest Region where he was born and raised, and where he found his inspiration for the last 30 years. Ever since Stephen can remember he wanted to express what was inside him, so he started painting on rocks and canvas from an early age on. Although he will paint anything, his heart lies in nature paintings. He is emotionally present at each location and pours his heart into his work. He is very resourceful and understands much about shadowing and lighting. 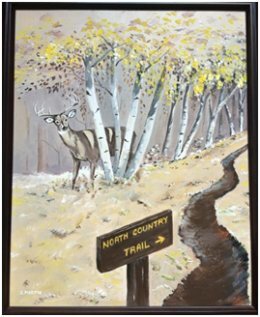 He currently exhibits some of his work at the Allegheny National Forest Visitors Bureau on 80 E. Corydon Street in Bradford, and other local venues.